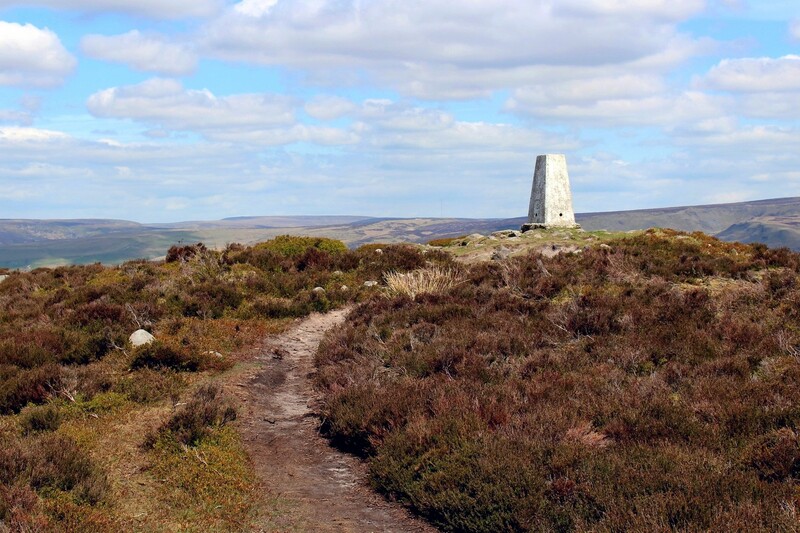 Peak District Countryside Blog | Peak Walking Adventures. Interesting things we have seen on our wonderful guided walks around the Peak District and Derbyshire Dales. Last Saturday was a really special day when we led a walk for The Peacock Hotel in Rowsley through the two ancient estates of Chatsworth and Haddon. In addition to enjoying stunning scenery throughout the guided walk, customers learned about the fascinating history of these two estates. What made the walk really special was that Lord Edward Manners had very kindly granted us permission to walk through the private part of the Haddon Estate that isn’t normally open to the public. He had also arranged for us to have a private guided tour of Haddon Hall after a delicious lunch at the Haddon Restaurant. The staff of the Haddon Estate looked after us really well on the day! The private part of the Haddon Estate includes the old orchard, and the medieval deer park. This is a beautiful, very natural looking area of parkland that has largely been left undisturbed for centuries. Through here, we saw lots of beautiful mature trees, many of which had been planted by different generations of the Manners family. We saw fascinating lumps in the ground that were massive ant hills (a sign that the land has been left undisturbed for a long period of time), and we were able to look into the abandoned tunnel that the old London to Manchester railway line once passed through. The estate is managed for conservation and we saw evidence of many initiatives to encourage wildlife, birds and a diverse range of plants and trees. The photo gallery below shows some of the highlights of the day. Exploring the entrance to the Haddon Tunnel in the private part of the Haddon Estate. The London to Manchester railway line once passed through here. Walking along the track-bed of the old railway line in the private part of the Haddon Estate. Looking down an air shaft into the old railway tunnel in the private part of the Haddon Estate. The footpath through Manners Wood. All around the top edge of Kinder Scout there are fascinating gritstone rock formations. On our walk today along the northern edge of the mountain, we passed these. They are known as ‘The Boxing Gloves’. If you use your imagination a little, you can see a face with gloved, raised hands up in front of it. Whether you think they look like a man with boxing gloves on or not, it’s a really beautiful place! Chunal Moor is a beautiful area of high, heather covered moorland in the Dark Peak with paths leading onto it from two points on the A624 between Hayfield and Glossop, and from Mill Hill. Upon studying the Ordnance Survey map, you will see the highest point on the moor is named Harry Hut. So who was Harry and where is his hut? Well, it appears that no-one knows! There is certainly no hut there now, but there are a few loose rocks around the trig point, so maybe Harry did build some kind of shelter there many years ago. What do you think? It’s certainly a beautiful place and the paths tend to be quieter than those on nearby Kinder Scout and the Pennine Way. Our walk yesterday took us over five small hills in the area of the upper Dove valley, one of which was Chrome Hill. From my photo, it’s easy to see why is it known locally as ‘The Sleeping Dragon’. The classic walk over Chrome Hill is to ‘walk the dragon’s back’ which is exactly what we did. Stunning views can be enjoyed from the ridge back up the valley towards the moorlands of the Dark Peak to the north, and looking south down the Dove Valley over White Peak countryside towards Parkhouse Hill, Hitter Hill, and High Wheeldon. You can enjoy a guided walk with us over Chrome and Parkhouse hills on our occasional open group guided walks, or by hiring your own personal walking guide. Yesterday, on our semi-wild camping expedition in the White Peak area of the Peak District we walked up to the trig point at the top of Harborough Rocks. It’s only a short distance off the High Peak Trail near to Brassington. 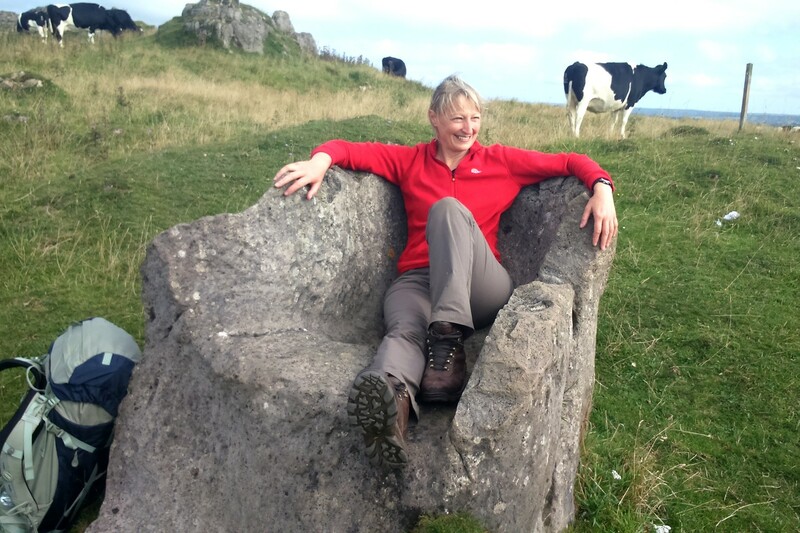 A fascinating feature is this limestone rock chair. Although many of the rocks in this area have eroded naturally into unusual shapes, it’s likely that this particular feature has at some point in history been carved by man. No-one seems to know when, but graffiti on the back of the chair dates as far back as 1757. The chair is actually quite comfortable and certainly offers excellent views across the Derbyshire countryside.